Having set out at 7.30am to do the Campuhan Ridge walk in Ubud before the sun got too hot, we decided we would have breakfast/brunch on the way back to Penestanan. The walk starts from stairs near the Campuhan Bridge that take you down to the river bed where you negotiate crossing over rocks to more stairs that lead up to the impressive temple on the other side, and the actual start of the “trek” up the ridge. We were lucky to have the aid of a makeshift bamboo “bridge” to get us across. The walk itself up the ridge affords stunning views across valleys on both sides. After about 3km of rolling hill climbs, you reach the village of Tegallalang with it’s rice fields and then walk another 4kms or so through the village of Kedawatan towards Jalan Sangiangan, the main route into Ubud. This stretch involves very steep hill walks between Tegallalang and Kedwatan and we certainly worked up a sweat and an appetite! Just as we leaving Kedawatan heading towards Ubud, we noticed a spotless Warung with a freshly delivered Babi Guling pig being chopped up for the day’s servings. We couldn’t resist knowing that most local warungs only serve Babi Guling fresh in the mornings and run out by midday. We were also keen to sample Babi Guling outside the now-world famous and tourist focussed Ibu Oka in Ubud central. Having been to Ibu Oka many times in the last decade, from it’s original dirt floor premises opposite the Ubud Palace, to the now massive hall-like venue occupied by Ibu Oka 2, the sight of the small and spotlessly clean, local Warung Ibu Suna with locals tucking in, was very appealing. So, in we went and we were not to be disappointed. The Babi Guling was served with rice, hot chilli sambal, a delicious spicy lawar (mixture of green ferns and finely chopped green/snake beans and porky bits, juicy pieces of pork, crispy innard bits and brilliantly crispy, “glassy” crackling. The soup accompanying the Babi Guling was one of the best we have ever tried and included pork pieces on the bone, cooked in the soup to a melt in your mouth texture. All this, and a bottle of Rasa Temulawak Beruap (see below for info)for only IR65,000 for the 2 of us! There are no menu choices here but they definitley do their speciality very well. I have googled to find other reviews of Warung Ibu Suna and cannot find any mentions on Trip advisor or anywhere. I doubt very much that we are the first tourists to visit and enjoy Ibu Suna’s hospitality and delicious Babi Guling but I suspect they might not have wanted to share this very tasty secret with the world just as yet. Ps. We then walked the rest of the 3.5km back to Penestanan energised by our power breakfast/brunch! Sounds fabulous and looks so gorgeous. Mind you the humidity and perspiration would have killed me! We have 20 coming tonight to watch the fireworks then lunch tomorrow so that is not a good resolution to make. Hope you continue to enjoy. 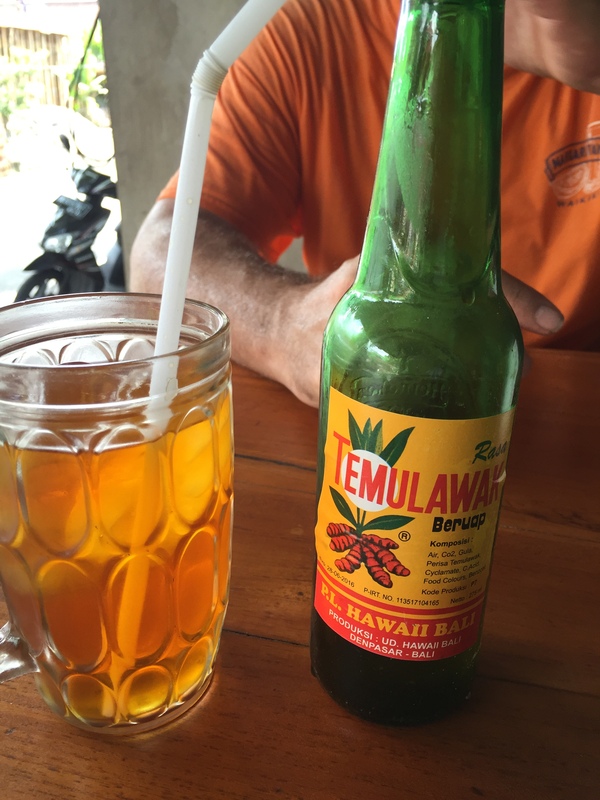 your blog inspired obama, he did had babi guling and temulawak during his visit to Bali this year. Glad he did and hope you enjoyed. Are you saying Barack Obama read my blog and was inspired?? Oh my goodness that would be amazing! In fact I might visit Ibu Suna tomorrow for some Babi Guling, now that you remind me! !